« What to do with all the images? I have a bad cold or allergies not sure which one going to see the doctor tomorrow. I did not have time or energy this week to even think of a blog post so here is my failed attempt at what I thought would be a quick tutorial. I found the project here…. and thought heck that should be easy to do. I do not have burma cord (or even know exactly what it is) but I could substitute and be creative what could go wrong??? 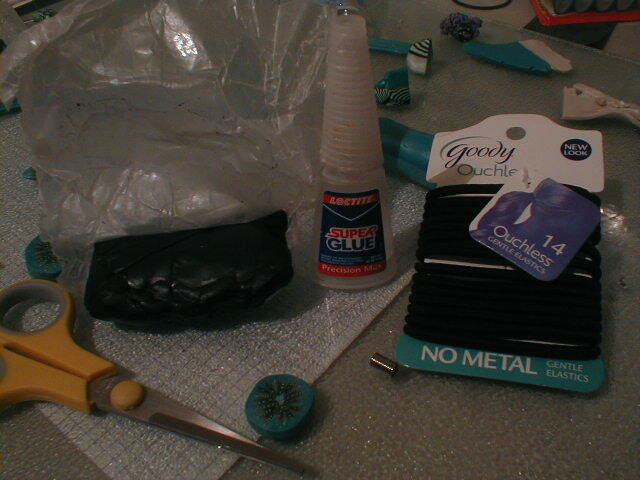 So here are my supplies as I try to replicate it. Using pony tail holders for burma cord, what looks like the metal things she uses, and the other assorted items. From the looks of that quick cane I am sick do you see how I did not even get the center right? Oh well it will look cool on something. 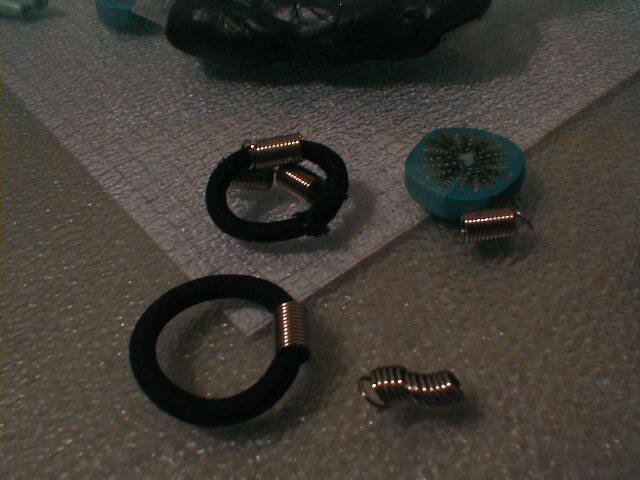 I started by trying to cut off the end of my metal thing with my Heavy cutters. That did not go well at all I made dings in them. 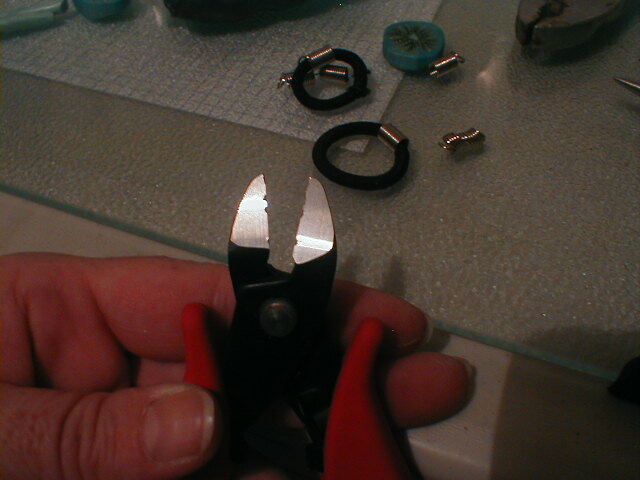 Those are my good cutters for heavy-duty stuff! Okay so I will try to smoosh the end down and then cover with clay. Got to remember to cut at an angle so it sticks better. The pony tail holders are too big to fit in my metal thingie. I have some thinner black cord I can use. The thin cord works got it centered now just to make sure it smooshes. Smooshing did not go well with the metal thingies I have. Hmmmm I guess that is my clue to remember to have the right supplies when I want to try something or else it probably will not work. I am sure trying when I feel better would also be a step in the right direction. So when was the last time you tried a project and it did not work not because of your abilities but because you did not have the right supplies? I am off to bed with a cup of hot tea and some cough drops very thankful I have the weekend off to get feeling better. I look forward to the tutorial next issue so I can find out where to get the cord, and those metal thingies. 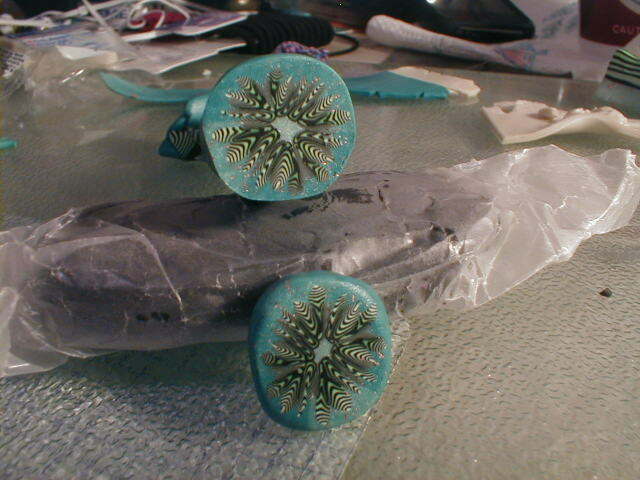 This entry was posted on May 1, 2010 at 1:32 AM and is filed under Artistic Motivation, polymer clay, Polymer Clay Cane. You can follow any responses to this entry through the RSS 2.0 feed. You can leave a response, or trackback from your own site.